VANCOUVER, WA (May 29, 2018) — This year is all about a bigger, brighter boom! Area residents can elect to end their Independence Day with a bang at Vancouver’s Fireworks Spectacular. They can pack a snack and a blanket, head to the Fort, and stake out their spot to watch the biggest fireworks show in the region. 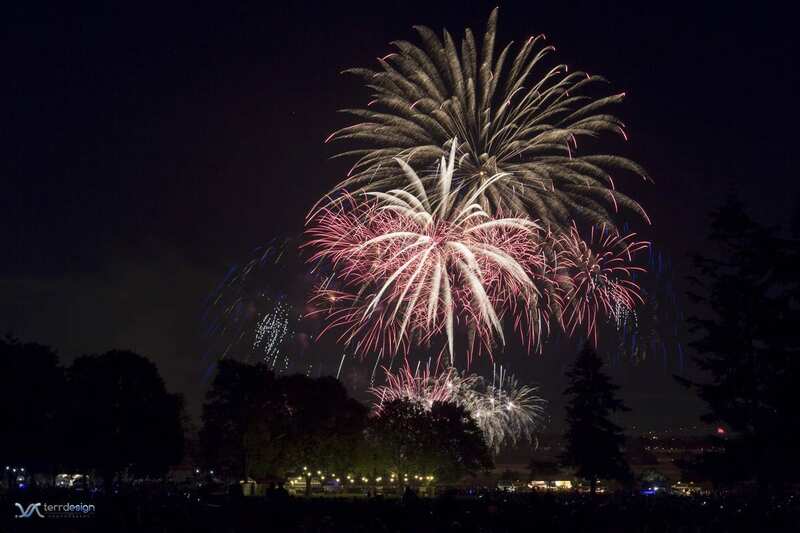 The general public will be able to “celebrate freedom for free” this year on the 4th of July, with no admission charge to Vancouver’s Fireworks Spectacular at Fort Vancouver National Historic Site presented by Columbia Credit Union. It will be “all about the fireworks,” says a release from The Historic Trust. “With the new city-wide ban on retail fireworks, the city of Vancouver is pleased to support the Fireworks Spectacular to help preserve fireworks as part of annual Independence Day traditions,” said Mayor Anne McEnerny-Ogle. While in the past this was a full day event, this year attendees are encouraged to come in the evening and enjoy the biggest, brightest fireworks show in years. We recommend community members start arriving after 6 p.m. in anticipation of a spectacular fireworks show beginning at 10:05 p.m. Visitors should be aware that there will be no food vendor services on site at this year’s event. Visitors are encouraged to either eat before coming to the site, or to bring their own picnic dinner for the event. During the day, visitors can explore the attractions at Fort Vancouver National Historic Site. Tour The Historic Trust’s Marshall House and Providence Academy; explore the National Park Service’s Fort and Pearson Air Museum; or check out the gift shop, bookstore, historic art, rotating exhibits, and theater at the Fort Vancouver National Historic Site Visitor Center. “After conducting an assessment of the event’s structure and costs, in collaboration with the city of Vancouver and the National Park Service, and reviewing feedback from participant surveys, The Trust recognized that the fireworks show is the element most valued by the community. We’re focusing on that – giving our audience what they want most,” said Trust President & CEO Mike True. “The Trust is committed to a tradition that began more than 50 years ago and is staging the region’s largest and most memorable fireworks displays,” said True. The fireworks will launch up to 500 feet high, cover a radius of 500 feet wide, and feature unique special effects. The 2018 display will once again be staged from Pearson Airfield at Fort Vancouver National Historic Site and synchronized to music. Getting to the event is convenient with help from C-TRAN. Area residents can hop on one of C-TRAN’s free shuttles running every 15 minutes from two stops: Fisher’s Landing Transit Center on SE 162nd Street, and the 99th Street Transit Center. Shuttles begin free service to the fireworks display between 6 p.m. and 8:30 p.m. Return service will be available immediately following the fireworks show. Paid parking lots will be available to the east and west of Fort Vancouver National Site and all downtown metered parking is free for the holiday. ADA parking is free onsite along 5th Street for those with a valid ADA permit. “Vehicle access will be restricted beginning at 8 a.m. and entry gates will be in place. Bags will be checked all day,” said Event Director Amy VanCamp, “but we encourage people to come after 6 pm.” Donations will be collected at the gates from those who wish to contribute to the event, with a portion of all proceeds supporting the Lower Columbia Veterans Coalition, a collective made up of the Community Military Appreciation Coalition (CMAC), Vancouver Barracks Military Association (VBMA), Combat Veterans International Chapter 9 (CVI), Buffalo Soldiers – Moses Williams Pacific Northwest Chapter (Buffalo Soldiers), and Special Forces Association (SFA).